Here is a press release about a new book that I will be reviewing in two weeks! I can't wait to share with you the goodies in this book. YOUR DOUGH JUST RIGHT ON THE FIRST TRY! Frustrated with your bread-baking skills? Yearn to have perfectly baked baguettes or beautiful brioche in your home? Sidestep years of unnecessary trial and error and learn how to bake bread like a professional without ever setting foot in a cooking school. With over 230 color photographs, more than 150 step-by-step instructions covering basic to advanced techniques, over 200 tips, and sidebars filled with invaluable information and troubleshooting advice, The Art of Baking Bread will teach you to work, move, think, anticipate, smell, feel, and, ultimately, taste like a true artisan baker. 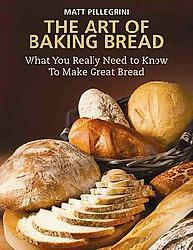 The Art of Baking Bread offers what no other book does—the secrets of successful bakers—in a language that anyone can understand. If you want to possess the exceptional know-how and confidence it takes to make perfect ciabatta, focaccia, challah, sour dough, and more, then The Art of Baking Bread will be your new best friend in the kitchen. From the Eight Essential Steps of Bread Baking (preparing your Mise en Place, properly mixing and kneading your ingredients, properly fermenting your dough, to proofing, shaping, and resting your dough before baking) to recipes for straight dough, prefermented dough (baguettes, ciabatta, and focaccia), enriched dough (pain de mie, brioche, and challah), and sourdough, The Art of Baking Bread is the only book on baking bread you’ll need. Matt Pellegrini, a lifelong home baker and cook, is the coauthor of Cowboy: The Ultimate Guide to Living Like a Great American Icon, which includes an entire chapter on mastering the art of chuck-wagon cooking. In addition to a career in writing, Matt has worked as a strength coach, carpenter, litigation attorney, public policy analyst, and may things in between. He lives in Denver, Colorado, with his cattle dog, Appaloosa. Print off end of the Month Coupons today! Cape Girardeau, Missouri Deal of the Day! Homeschool LInk up and Top 10 Get Kids Fit! Hungarian Chicken Paprikas super easy! Southern Illinois Deal of the Day!